Synopsis: On a midnight train, four hours away from her wedding, Beth McMurray discovers the devastating truth about the powerful senator she’s about to marry. Convinced nothing could make this stormy night worse, the train wrecks, and she tumbles straight into the arms of an outlaw. My take: Promise Me Texas is the latest book in the Whispering Mountain series. It’s the story of the youngest McMurray daughter, Beth. Not only does she find herself with a pretend husband but she’s suddenly looking after two young brothers, a teenage girl and a boy on the verge of adulthood. This unlikely group of six sets off on a journey in search of better lives. Along the way they’ll meet interesting characters – from outlaws to Texas Rangers. In addition to Beth and Andrew’s story the subplots involving the younger characters pulled at the heartstrings. The plight of these children in 1870s Texas was formidable. Thankfully, they had Beth and Andrew looking out for them. 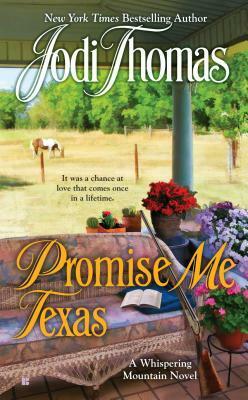 I really enjoyed Promise Me Texas. Drama, humor and an unusual love story (or two) combine for an entertaining read. Fans of the Whispering Mountain series will be happy to read the newest book and if you, like me, have good memories of TV westerns of the 1960s (The Big Valley, to name one), I think you’d love it. Promise Me Texas could stand alone but I recommend the entire series.